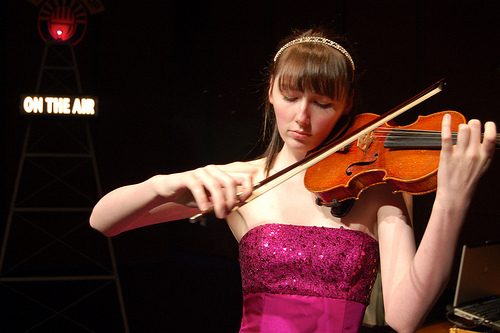 The Scherzo movement is a dazzling piece of perpetual motion. 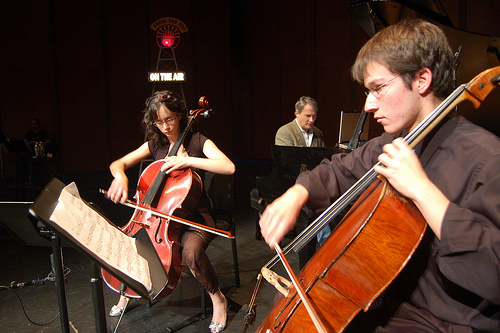 The lines composed of playful rhythms and unique chromatics weave in and out of each other as two cellos unite. I am drawn to the music’s energy and changing meter, which keeps things moving and provides a jazzy off-kilter feel. I also appreciate how equal and balanced the difficulty level among all three parts is. My tricky passages and spots in the limelight are as equally challenging as Richards, but satisfactorily unique. 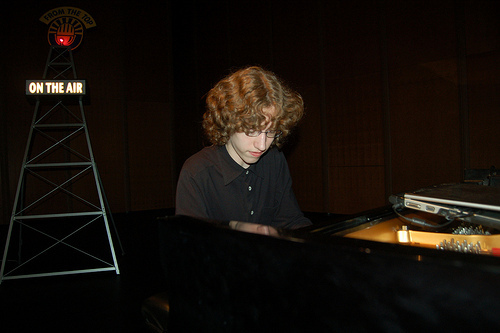 One unique aspect of the piece is that it contains very little melodic line – in fact, there are my four notes that can be considered part of a sing-able melody. 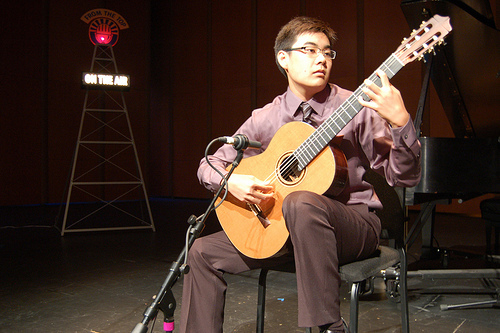 The piece’s strong point is its energy and playfulness, which is what I strive to emphasize when I play it. I hope to bring out the pieces sparkle and syncopation so that it sounds not like an etude, but like a dazzling showdown between me and Richard. Post-Show Reflection: I really enjoyed the post-concert celebrations, such as meeting the audience, taking group photos, and getting to know the other performers beyond the stage. Performing at the Sandler Center was a lot of fun. The rehearsal was far more unnerving, since I felt more uncertain and uncomfortable with what I was doing. However, the performance was so much fun and I wasn’t nervous at all. Music can energize, empower, vocalize, believe, ignite, touch, inspire, achieve for more than just words can. It’s motivating and reaches down to the very core of one’s being. There is an incessant energy to this piece. Once the piano begins it, there is really no respite from counting. Indeed, the foolish cellist can fall victim to the many seemingly simple rests. 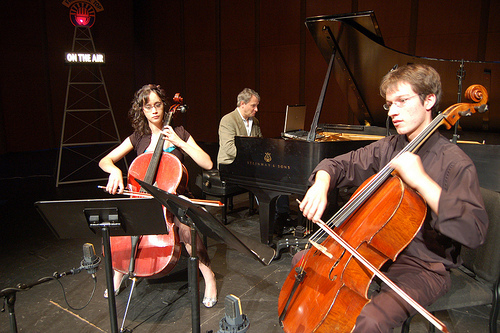 Although “cello duo” generally implies two cellists playing together, for much time in this piece, the two cellos are not playing at the same time. Rather, the largest phrase is broken up into little ideas playing off each other, with almost perpetual support from triplets in the piano. Truly, the one word to describe this piece is quirky. There is always something just a bit “off” in it. The harmonies and texture clearly look back to something Baroque, but always with a jazzy twist. The little theme is almost laughably tenacious, chasing itself around the circle of fifths throughout the piece. So instead of playing it seriously, perhaps it is best to embrace the quirkiness and convey its unifying energy. Otherwise, it’s just that one theme and a few other seemingly superfluous melodic moments. Playing this piece scares me a lot. One little misstep can lead to a train wreck, as the maniacal river of constant triplets jeers at the hapless cellist who has lost his or her rhythmic foothold. Even when a brave and savvy cellist enters correctly, the music doesn’t quite fit. Ultimately, this piece never feels comfortable, even though it should, and this could very well be the biggest challenge in performing it. Post-Show Reflection: I had imagined that performing on From the Top would be extremely intimidating, but it was actually really comfortable and fun. I loved meeting the cool group of people gathered together to put on this great radio show. Everyone involved was so nice and helpful, and it was also fantastic to share the experience with a good friend! Music can make everyone see a beautiful world. The piece reminds me of the constant thoughts, emotions, and feelings that bounce frantically around the human mind. The Fuoco constantly twist and turns with panicky and reckless abandon, streaking towards answers only to seemingly transition to something completely different. It contains almost every emotion: anger, joy, fear, and sadness. It varies an incredible amount, its only consistency being its speedy, agile tempo, yet every last part sounds mystical and beautiful. Although the piece is played at lightening quick speed, the hardest part of the piece is not really technical but remaining musical and still managing to play in tempo. At first glance a jazzy, rock-like exercise, the Fuoco displays a wealth of hidden musical complexity when analyzed. The piece conveys a sort of reckless moodiness. At times it is soulful, at others it is angry; at times it is joyful, but it always remains frantic. Post-Show Reflection: My favorite memory was watching the FTT staff dancing, celebrating and singing karaoke after the performance. Performing on From the Top was really fun. One of the most engaging/comfortable performances I’ve ever had. The audience was very friendly, the cast was very encouraging, and the interview was very engaging. Music can do so much. I can’t write it down. I believe the Saint-Saëns Sonata to be one of the greatest pieces written for the bassoon. Saint-Saëns wrote magnificently for the instrument, and the piece calls for a wide variety colors, ranges, and dynamics that allow the performer to explore a very deep sense of musicality. This particular scherzo movement, the middle movement of the sonata, is very energetic in character. 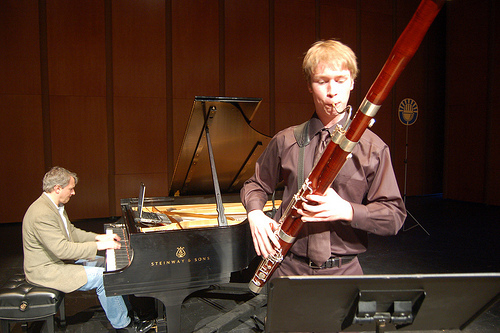 There is a lot of back-and-forth conversation between the bassoon and piano, and the middle section is lyrical and signing, contrasting with the staccato, buoyant main theme. I think this piece is unique among the solo bassoon repertoire in that it has more emotional and expressive depth than most other pieces written for the instrument; I would consider it the pinnacle of romantic music for the bassoon. Although this piece is very technically demanding, the real challenge is doing justice to the beautiful phrases and overall structure that Saint-Saëns crafted so masterfully. Post-Show Reflection: My favorite memory was eating dinner at McCormack and Schmicks’s with Noah, his dad and my dad. I had some excellent Mahi Mahi sautéed over a crab and potato mixture. We talked extensively about our experiences, the music world in general, and plans for the future. Performing on From the Top was both nerve-wracking and exhilarating. It was really fun both performing and interviewing on the same stage. Music has the power to inspire, unite people, and bring out the best and worst in us! No, but really, music is positively energizing stuff. Danse Macabre is an art song originally composed for voice and piano. The text was written by poet Henri Cazalis, in 1872. It is based on an old French superstition. Legend has it that at midnight on All Hallows Eve, “Death” makes an appearance and summons skeletons from the grave to dance while he plays the fiddle, characterized by the violin implementing scordatura tuning. When it was premiered as a symphonic work in 1874, the disturbing sounds Saint-Saёns had orchestrated to illustrate the tale caused great unease within the audience. Two years after this first performance, he revised the piece, turning it into a tone poem for orchestra, and replacing the vocal line with solo violin. A trademark aspect of the work is the recurring tritone, also referred to as the “Devil’s Chord.” It begins with twelve ominous pizzicato D’s tolling midnight. My favorite part is anticipating the first double stop that comes crashing in and takes the audience by surprise. Rattling bones are portrayed by the use of col legno, and ferocious winds by rapid chromatic passages. The skeletons dance until dawn when the rooster crows, and they must return to their graves…until next year. I found this work intriguing and fun to play. It took a lot of thought and experimentation to create the tone that evokes the right mood and leaves goosebumps behind. It is vital to convey the mysteriousness that Saint-Saёns so ingeniously captured in this arrangement. Post Show Reflection: The Sandler Center for the Performing Arts holds a special place in my heart. For my dream of performing on From the Top to come true on this stage was amazing. The night of the performance, when I was standing backstage and waiting to go on, and I heard the music begin for my turn to walk out, I felt tears well up in my eyes. Performing with Mr. O’Riley was incredible. I felt like we really connected and made Saint-Saёns’ masterpiece come alive. It was great meeting the other kids and working with Mr. Vignieri and the From the Top staff and crew. The arts leadership workshop was inspiring. As musicians, I believe we have a responsibility to share our music with the world. Every time I perform, my hope is to touch at least one person’s heart. In the end, that’s what it is all about. Music has the power to fill in the blanks that words can’t. It inspires change and progress. When I play this piece, I think about the story behind it. Liszt based this piece off a poem on the Faust legend by Lenau. In the beginning, Liszt shows the scene with villagers dancing waltz. Later, you can see the devil trying to convince Faust to come with him. The thing that is most different about this piece from the rest that I’ve played is the fact that it’s not just any piece of music that a composer thought up. It is actually based off of someone else’s idea, and the music follows the plotline of the poem, which it is based off of. Post-Show Reflection: My favorite memory from the three days was the performance. It was an interesting experience. Every other time I’ve performed I didn’t have to talk so it was very different. Music has the power to get you interested in many different things. It also has the power to influence your thought process.